Samsung's true wireless Galaxy Buds could charge on Galaxy S10 | What Hi-Fi? 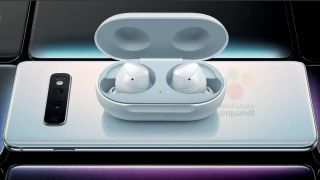 Samsung is all set to unveil its next line of Galaxy smartphones – rumoured to be the Galaxy S10, S10E and S10+ – on the 20th February, and with them will likely be Samsung’s next true wireless earbuds. According to a leaked promotional image posted by WinFuture, the charging case of the new buds (which will probably be called 'Galaxy Buds') will be able to wirelessly charge simply by being placed on the rear cover of the forthcoming flagship Galaxy S10+ handset. The report says the headphones should cost 149 euros (so roughly £135-140), too, putting them broadly in line with the current £129 price of Samsung’s existing Gear Icon X true wireless earbuds, which launched in October 2017 for £200. Whether they will be offered at a discount with a Galaxy S10 purchase remains to be seen, but we look forward to finding out more details in a fortnight’s time.